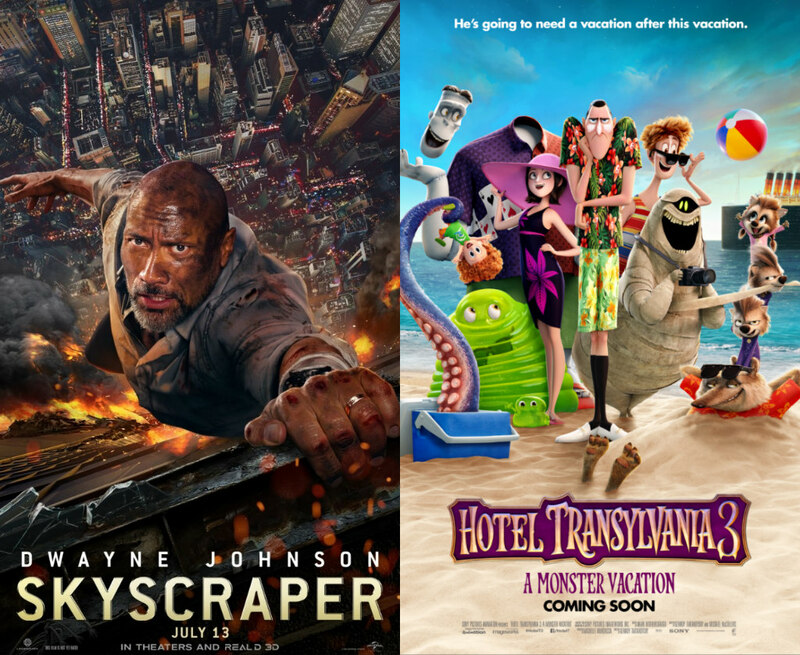 Dearest Blog: This weekend it was off to Marquee Cinemas for a pair of movies that were right up my alley: Skyscraper and Hotel Transylvania 3: Summer Vacation. First on the agenda: Skyscraper. When the world's tallest and most technologically-advanced building is sabotaged, it's up to Security Consultant!Rock to rescue his family and take down the baddies who are after his boss. Something you should know about Skyscraper from a glance at its one-sheet, nevermind a single trailer, is that the movie is stupid. We are talking Fast & Furious levels of epic stupid; nothing about it makes any sense in the real world. I feel like the advertising doesn't leave room for doubt, but since unrealistic expectations seem to make a great many folks unhappy with movies, I'm telling you anyway. I'm also telling you this does not in any way, shape, or form make Skyscraper a less-than-great summer blockbuster. First we have Dwayne Johnson. The beauty of Dwayne Johnson is...well...Dwayne Johnson. By the time the CGI embers have settled, you'll find yourself believing he really could wrangle all this ridiculousness and emerge the victor. Ice that cake with his boundless charisma, and the result is always a supremely watchable film. His supporting cast hardly matters, but Neve Campbell and Chin Han are solid, while Pablo Schreiber and Kevin Rankin are even better despite being woefully underused. The kids are cute and not irritating, which is essentially all I ask of kids, onscreen and off. Skyscraper boasts terrific disaster effects and insane stunts, but the best thing I can say about the movie is it features a lead character with a disability, but never becomes *about* the disability. He's just a guy doing what he has to do, and that sort of representation in a blockbuster like this is quite encouraging. A few small warnings and negatives: If you are squeamish about heights, best sit this one out; heights don't really bother me, and I haven't closed my eyes so much since The Walk. (That's without the 3D.) Some of the action/fight sequences are too comical even for a film this over-the-top, and, despite end-to-end action, the movie does feel a little long. Skyscraper runs 102 minutes and is rated PG13 for "sequences of gun violence and action, and for brief strong language." Bolstered by its charismatic lead and stellar effects, Skyscraper is an exciting bit of pointless summer fun. Of a possible nine Weasleys, Skyscraper gets six and a half. Next up, one of my most-anticipated titles of 2018 (yeah, you heard me): Hotel Transylvania 3. Mistaking Drac's loneliness for exhaustion, Mavis arranges a family vacation on the high seas. Despite my intense dislike of Adam Sandler, I have always had a soft spot for the Hotel Transylvania movies. It may be that I'm predisposed to like movies about Dracula, or just that Sandlier is strictly limited to doing only one stupid voice, rather than a bunch of them, but, whatever the reason, I really, really look forward to these movies and I have loved every one. Hotel Transylvania 3 is surprisingly original. Its humor is more amusing than laugh-out-loud funny, but sharp animation, bright colors, and lively tunes will keep kids and adults engaged. Action sequences are outstanding, with a terrific opening sequence setting a fun tone. A standout score by Mark Mothersbaugh ties up the whole thing in a charmingly creepy bow. HT3 has a sweet message that's more than adequately conveyed as it plays out, so, if I had one small quibble, it's that the movie does belabor its point a bit at the end. Hotel Transylvania 3 clocks in at a quick 97 minutes and is rated PG for "some action and rude humor." Hotel Transylvania continues to surprise with a third installment that may be its best yet. Of a possible nine Weasleys, Hotel Transylvania 3: Summer Vacation gets eight.